17 Night Cruise sailing from Buenos Aires to Bridgetown aboard Silver Shadow. There are few places quite as enchanting as the Greek Islands in spring. Unless it is the west coast of Italy. 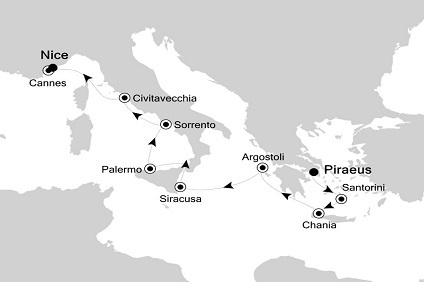 This is a magical voyage, filled with ancient gods, sun-dappled olive groves and bright, aquamarine seas. When the flavours of Santorini, Crete and Cephalonia mingle with the sights of Sicily, the Amalfi Coast and the eternal city, a satisfaction is guaranteed. It's no wonder that all roads lead to the fascinating and maddening metropolis of Athens. Lift your eyes 200 feet above the city to the Parthenon, its honey-color marble columns rising from a massive limestone base, and you behold architectural perfection that has not been surpassed in 2,500 years. But, today, this shrine of classical form dominates a 21st-century boomtown. To experience Athens—Athína in Greek—fully is to understand the essence of Greece: ancient monuments surviving in a sea of cement, startling beauty amid the squalor, tradition juxtaposed with modernity. Undoubtedly the most extraordinary island in the Aegean, crescent-shape Santorini remains a mandatory stop on the Cycladic tourist route—even if it's necessary to enjoy the sensational sunsets from Ia, the fascinating excavations, and the dazzling white towns with a million other travelers. Called Kállisti (the "Loveliest") when first settled, the island has now reverted to its subsequent name of Thira, after the 9th-century-BC Dorian colonizer Thiras. The second-largest city in Crete and capital of the Homonym Prefecture, Chania is located in Minoan Kidonia at the end of the Homonym Gulf between the Akrotiri and Onicha peninsulas. Chania City is divided into two parts; the Old Town, which is comprised of several connected districts built around the old Venetian Harbour, and New Town, a larger, more modern city whose centre is situated next to, and south of, the Old Town. Siracusa, known to English speakers as Syracuse, is a wonder to behold. One of the great ancient capitals of Western civilization, the city was founded in 734 BC by Greek colonists from Corinth and soon grew to rival, and even surpass, Athens in splendor and power. It became the largest, wealthiest city-state in the West and a bulwark of Greek civilization. Although Siracusa lived under tyranny, rulers such as Dionysius filled their courts with Greeks of the highest cultural stature—among them the playwrights Aeschylus and Euripides, and the philosopher Plato. Once the intellectual capital of southern Europe, Palermo has always been at the crossroads of civilization. Favorably situated on a crescent-shaped bay at the foot of Monte Pellegrino, it has attracted almost every culture touching the Mediterranean world. To Palermo's credit, it has absorbed these diverse cultures into a unique personality that is at once Arab and Christian, Byzantine and Roman, Norman and Italian. Sorrento may have become a jumping-off point for visitors to Pompeii, Capri, and Amalfi, but you can find countless reasons to love it for itself. The Sorrentine people are fair-minded and hardworking, bubbling with life and warmth. The tuff cliff on which the town rests is spread over the bay, absorbing sunlight, while orange and lemon trees waft their perfume in spring. Winding along a cliff above a small beach and two harbors, the town is split in two by a narrow ravine formed by a former mountain stream.